Every day, millions of Canadians electronically transfer funds among themselves, using their bank or other financial institutions as an intermediary. Conveniences like Interac debit purchases, online e-transfers, or wire transfers give the perception of near instantaneous transactions. However, even though our financial system operates on the assumption that these payment systems are instantaneous, often no real or final value changes hands at the time or even immediately after the electronic transaction is completed. Instead, electronic payments are merely a transference of account and ledger information from one financial institution to another, with an intention to “settle” those accounts and finalize the transaction through the transfer or attribution of actual assets at the end of each business day, or even later. When the actual transfer of assets is delayed until the settling of accounts, there is a risk that the payor will back out or be unable to fulfill the obligation. For lawyers that manage trust accounts, this brings the attendant risk that the receipt of funds may be reversed at a later point—potentially after the lawyer has already drawn from the trust account in reliance of those funds received. This could lead to overdrawing from the account and breach of trust. Therefore, it’s good practice for every lawyer to ensure that they understand the Canadian electronic payment systems. What are the electronic payment systems in Canada? Pursuant to the Canadian Payments Act, R.S.C. 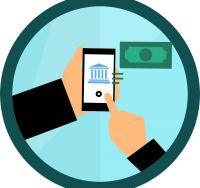 1985, c. C-21, Payments Canada currently operates two electronic payment systems that handle the electronic transfer of funds between participating institutions: the Large Value Transfer System (LVTS), and the Automated Clearing Settlement System (ACSS). The LVTS is the payment and clearing system that handles the irrevocable transfers of funds between two financial institutions. It was implemented in Canada in 1999 as a regulated and centrally managed system that replaced the old methods of using telecommunication systems such as “Telex” to effect wire transfers between two geographically separated financial institutions. Participating financial institutions must post sufficient collateral with the Bank of Canada and make pre-determined bi-lateral credit arrangements with other participating financial institutions at the start of each business day in order to guarantee payments that will be made through the LVTS. Because of this, once a payment has been approved by the LVTS system administered by Payments Canada, it is irrevocable and the receiver institution must generally provide the beneficiary with access to the funds by the end of each business day. The ACSS handles non-LVTS electronic transfers in Canada. This is, essentially, most or all of the retail and personal money transfers that Canadians encounter day-to-day. Paying for a coffee with Interac debit, withdrawing cash from an Automatic Banking Machine (ABM), receiving wages through a direct deposit, or transferring funds through an online e-transfer are all transactions conducted through the ACSS. Transactions by way of paper instruments, such as bank drafts and personal or certified cheques, are also handled by the ACSS. What are the lawyer’s obligations? The Law Society of Ontario’s By-law 9 prescribes steps that lawyers must take with respect to financial transactions. The by-law sets out certain restrictions and security precautions that must be taken to manage electronic transactions conducted through a trust account, but it does not restrict lawyers from receiving or sending money from a trust account using either the LVTS or the ACSS. This means it is incumbent on the lawyer to understand how the different payment systems may impact their trust accounting. Section 9(3) of the by-law states that a licensee shall not, with respect to a client, withdraw from a trust account more money than is held on behalf of that client at that time. So, if a lawyer receives funds in trust by way of a transfer conducted through the ACSS (such as a retainer received by way of an Interac debit deposit, or closing funds received by way of a certified cheque or bank draft), the lawyer can be in breach of trust if she or he disburses those funds in furtherance of the client’s interests and later finds that the original transfer was reversed or cancelled. If receiving a substantial sum in trust by way of an electronic transfer, such as for a real estate closing, arrange beforehand with the parties and financial institutions involved that the payment will be conducted by way of the LVTS or will otherwise be irrevocable and final once received into the beneficiary’s account. If receiving funds into trust by way of a certified cheque, bank draft, or non-LVTS e-transfer, wait at least eight business days before withdrawing the relevant funds. LAWPRO’s “Limited Trust Account Overdraft Liability” endorsement in the Primary Policy excludes coverage for overdrafts relating to the failure to wait eight business days from deposit of counterfeit certified cheques or certified bank drafts into a trust account unless the insured has received confirmation in writing from either their Canadian financial institution or the drawee’s Canadian financial institution that the cheque or bank draft instrument is valid. However, be aware that fraudulent cheques can still be “reversed” in some circumstances long after that eight day period. Be on the lookout for signs of fraud. Our Cybercrime and Bad Cheque Scams Fact Sheet is a helpful resource that gives guidance for identifying and addressing bad cheque scams, phishing scams, and other potential dangers. As well, our Real Estate Fraud Fact Sheet sets out some common indicia of real estate scams, identity theft, and suspicious clients. Reviewing both will help prepare you for any potential dangers that come through your door. The only practical solution I can think of is for the buyer’s lawyer to have their bank fax a letter to the seller’s lawyer (asap after certifying the cheque) confirming the validity of the certified cheque. The seller’s lawyer can easily check that the incoming fax number matches the bank’s published fax number. My BMO branch is in favour of doing this and has given me a sample letter. Calling the buyer’s bank directly prior to releasing the deed does not work because you can only leave a message.